Select the Add Testimonial button. Enter	in the Testimonials, Author (optional) and Author’s Info (optional). Select the Delete button beside the testimonial that you would like to remove. Select the Edit button beside the testimonial that you would like to edit. 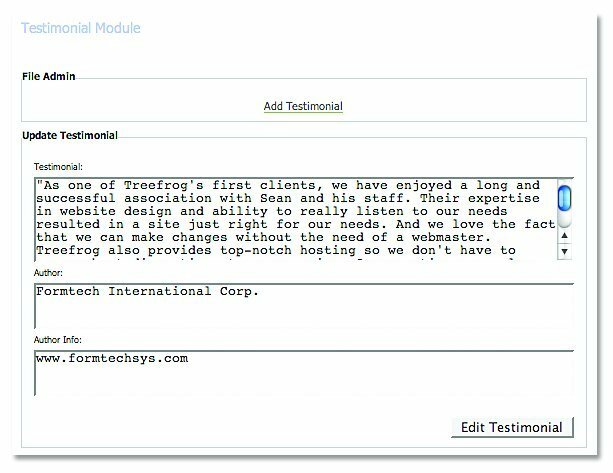 Make your changes to the content of the testimonial. 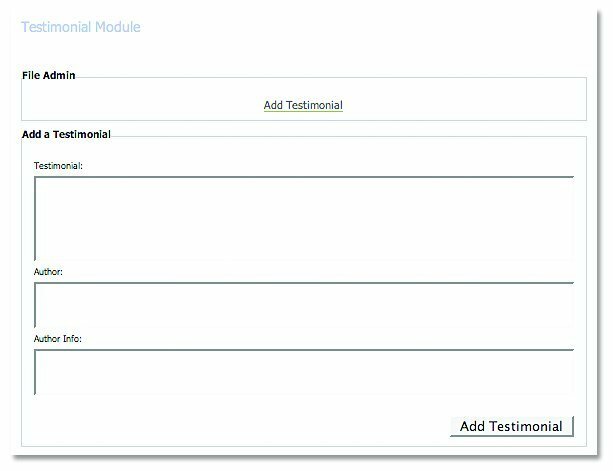 Select the Advanced button on the Testimonial Module. HTML Rule – adds a line between quotes. HTML Rule 50% – adds a partial line between quotes. Box – adds a box around quotes. Custom – customize the look and feel of the quotes using HTML. Default – uses the font and colour styles, as per the overall look and feel embedded into the skin of your website. Bold – makes the quote font Bold. Author – makes the quote the same font set for the Author format (i.e. italicized). Bold – makes the author font Bold. Author – makes the author font the same font set for the Author format (i.e. italicized). Bold – makes the author info font Bold. Author – makes the author info font the same font set for the Author format (i.e. italicized).